Final Fantasy is undoubtedly one of the most polarizing franchises in all of gaming. It’s a series that more often than not pushes host platforms to their limits while setting new trends in the RPG genre. This is why our resident JRPG fans have been so critical about its release. So while it’s possible to enjoy the game as is, Square Enix recommends players watch the anime Brotherhood: Final Fantasy XV as well as Kingsglaive, a full-length CGI film. Brotherhood is fantastic and gives players a better knowledge and background for the game’s main characters while the visually appealing Kingsglaive is a bit of a bore but also provides players a better idea of what’s happening in the game’s world before starting. 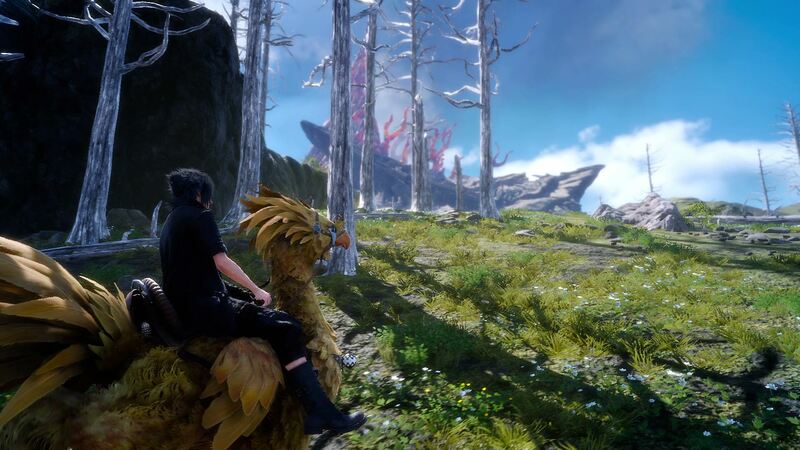 You can ride a chocobo? It MUST be a Final Fantasy game! The game puts players in the shoes of Prince Noctis Lucis Caelum (or Noct for short), successor to the Lucian throne, as he ventures out to the neutral city of Altissia to marry his betrothed, Princess Lunafreya Nox Fleuret in the hopes of putting a stop to the war. Of course, it’s a Final Fantasy that’s a part of an extended universe, so it’s a whole lot more complicated than that, but gamers should find solace in the fact that a lot of the common clichés that victimize Japanese RPG’s aren’t here, so Final Fantasy XV’s story is actually a breath of fresh air—even more so should you decide to invest the time into Brotherhood and Kingsglaive. While there are some obvious fantasy tropes, Final Fantasy XV is a whole lot more grounded than any other game in the series. The world of Eos is about as grand as you’d expect from any flagship Final Fantasy game, but as you explore each town and territory, it feels more like a road trip. Assisting Noctis on his journey are Ignis Scientia, Gladiolus Amicitia, and Prompto Argentum with the vehicular companionship of the Regalia, the king’s automobile. Yep, this is an actual in-game screenshot. More on that later. Ignis is sort of an advisor to the kingship and helped raise Noctis once he left the crown city. He’s also a heck of a cook, which is essential to the group as not only does is he sort of the caretaker, but he’s solely responsible for the group not eating complete crap. 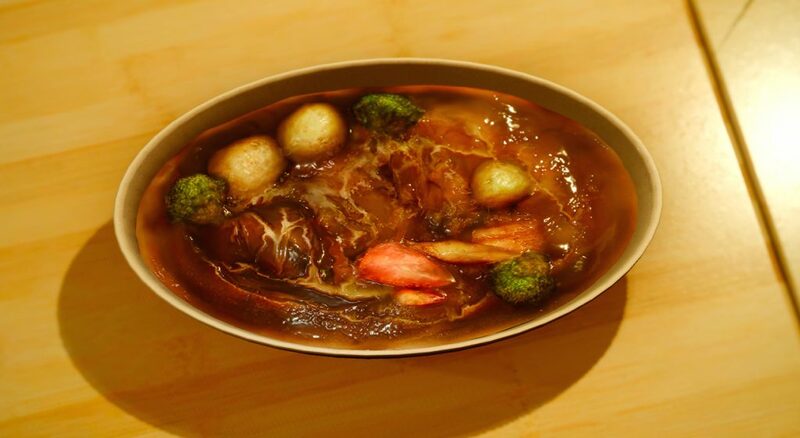 In fact, the foodporn is somehow one of Final Fantasy XV‘s highlights. Gladiolus, or Gladio for short, is the brawn of the group. He fights with a broadsword and was the man responsible for teaching Noctis how to fight. 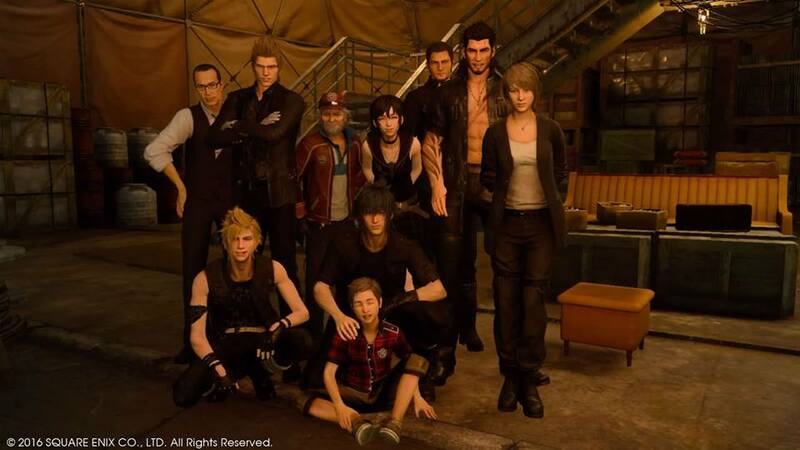 With Gladio around, the group’s chance of surviving raises substantially. The last party member is the skinny Prompto. He’s particularly annoying because he dies all the time, and he’s really just around to take pictures and document your travels. Ignis’ cooking, Gladio’s survival skills, Prompto’s photography, and Noct’s penchant for fishing all come into play in the game as each character progresses these skills in the game. With Ignis, you have to cook when camping. With Gladio, you just gotta keep fighting. With Prompto, you just progress through as many days as possible because he takes pictures throughout the day. And with Noctis, you obviously fish. You level these up as you gain experience doing these things–more on that later. The bromance between the four is really something to write home about, but if you don’t watch Brotherhood, it’s almost nonexistent. Without Brotherhood, you wouldn’t understand each of these guys’ struggles nor would you even know why they’re even there in the first place, so it’s almost necessary–almost as necessary as their stylish car. Yep, you gotta keep your car fueled. While it’s entirely possible to get to each of the game’s outposts on foot, the Regalia will more likely than not be your main method of travel. Aside from various banter from your travel companions from time to time as well as the fact that you can listen to select tracks from previous Final Fantasy games, driving in Final Fantasy XV is very much like sailing was in The Legend of Zelda: The Wind Waker. It’s oftentimes dull and until your party reaches about level 30, driving at night is ill advised because of ridiculously powerful monsters spawning near the main roads. Speaking of monsters, grinding is pretty heavy throughout most of the game, but I didn’t find grinding to be the chore that it is in many popular JRPG’s. 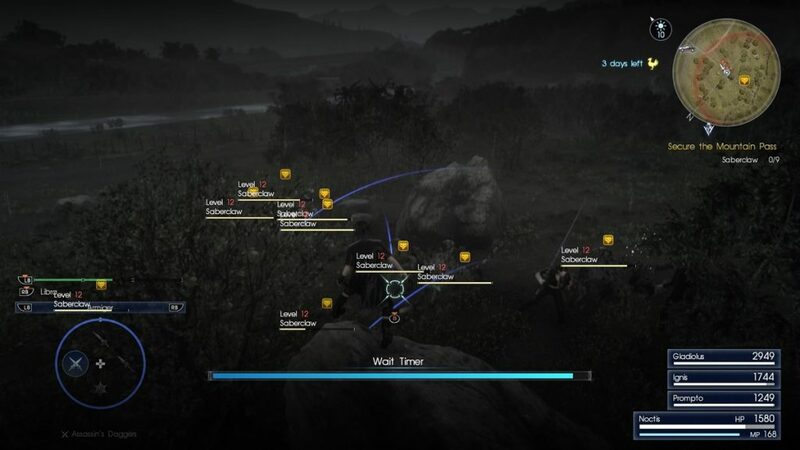 Almost as soon as the game starts, you’ll have access to bounty hunts and sidequests, and while bounty hunts are self-explanatory, a good amount of sidequests are also battle-based. Not only that, but every quest you finish grants you a certain amount of experience, which is awesome especially when finishing a sidequest that has nothing to do with fighting. It’s Final Fantasy XV‘s combat system that particularly stirs the pot with Final Fantasy and RPG loyalists, and we’ve made it pretty darn evident with various episodes of our Day 0 Update. While Final Fantasy XII and XIII really began the deviations from the traditional active-time battle system the series is known for, Final Fantasy XV does away with it entirely. The game adopts an action-based battle system more akin to that of Final Fantasy Type-0 and Kingdom Hearts. Players primarily use Noctis as he roams freely among the plains using the circle button for primary melee strikes, while the triangle button mixes things up with point warp and point warp strikes that allows him to zip in and out of danger. As someone who plays RPG’s primarily as a therapeutic escape, I had my reservations about an action-based battle system, but for what it does, it works extremely well and is hardly the stressful activity that I thought it would be. For better or for worse, as long as you’re using the right weapon, you can just go through battles running right at enemies and holding circle to automatically attack while your party mates assist with the dirty work. As for the other guys in your party, while you don’t have direct control of them, you can command them to perform an assisted attack with the with the left shoulder button which then sets up a QTE which works pretty well. I’m not sure if it was done on purpose, but once you get to the point where you rack up enough gil (the game’s form of currency), you can just buy potions, elixirs, and other medicine items and really just spam them when you get in trouble. I wouldn’t say that makes the gameplay any better, but it was definitely an option when in a bind. The action-based battle system really isn’t as stressful as it looks. The main thing I don’t particularly like about the battle system is how summons like Shiva are handled. In any other RPG, summons are strong attacks that are ideal to use against tough bosses. That’s absolutely the case in Final Fantasy XV, but they literally end battles. If you use a summon, the Eon you summon will definitely kill your enemy, except you can only summon them in the most specific cases, like the other three members of your party dying, or Noctis having extremely low health, or something of that matter. As with every Final Fantasy, you get a really cool animation when the summon happens, and with Final Fantasy XV the summon literally lays waste to the surrounding environment which is pretty cool. One interesting nuance is how the game’s battle and sidequest experience is handled. In literally every other RPG, experience points are automatically factored in and you level up with the experience points you have. 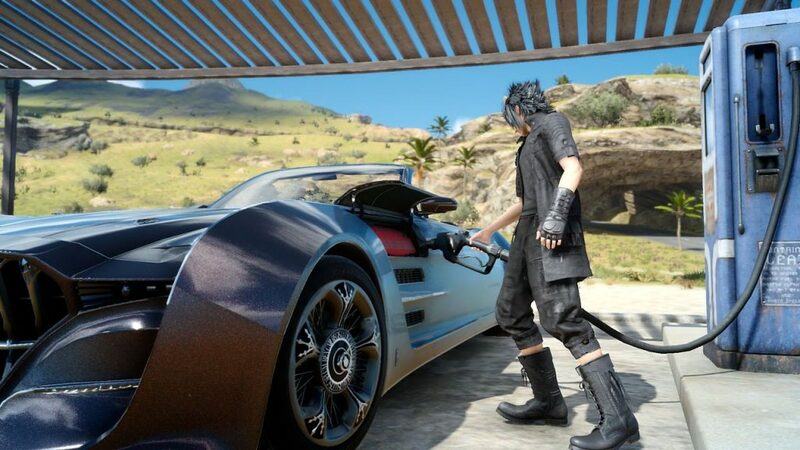 Final Fantasy XV doesn’t automatically do that until you spend the night at inns for a sometimes minimal fee or turn in at the game’s various campsites. I say “sometimes minimal fee” because there are also a couple resorts you could stay in for substantially larger fees, and they’ll actually multiply the experience gained. So for example, if you stay at one of these resorts with a 2.0x multiplier, instead of taking into account the 5,000 EXP you’ve gained, you’ll instead take in 10,000 EXP. There’s even one resort that has a 3.0x multiplier, making leveling up extremely easy if you’re careful about it saving the game every chance you get. On its own, Final Fantasy XV is a painfully average experience that can take anywhere between 30 and 50 hours to finish the first time through. It looks fantastic, the characters are actually well acted, and it has has a very solid soundtrack. It’s even pretty non-linear until you get to the game’s climax. Unfortunately, none of this matters if you were to play the game cold turkey. To really appreciate the game for what it is, you have to at least watch Brotherhood: Final Fantasy XV, which should literally take less than an hour. Confusingly, the Deluxe Version of the game (which is the one I picked up) only includes Kingsglaive, and as stated earlier while it did provide some nice background on what to expect in the game, it was just dull. I get that Brotherhood is already free and literally something you can watch on YouTube, but should people really go through that much effort to appreciate a game? I fully understand the vision that Tetsuya Nomura had for it, but it’s simply too much for a video game. Now if you did drink Square Enix’s Kool-Aid, which I’ll admit to doing, you have a heck of a game here. It’s no Trails of Cold Steel II, but Final Fantasy XV was a game I truly enjoyed and is something I’d love to talk about with other gamers, but again, the only way I can recommend it is if you’re willing to invest the time in its non-video game lore. 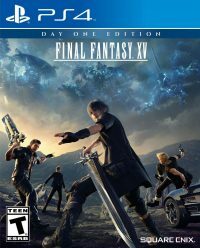 The Deluxe Edition of Final Fantasy XV for the PS4 was purchased by the reviewer.